Millions of Americans suffer from Post-Traumatic Stress Disorder (PTSD), approximately 44.7 million to be more accurate equating to 20 percent of the adult population. 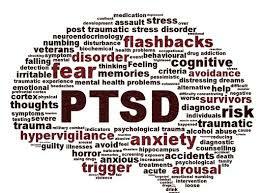 PTSD was not recognized as a psychological disorder until 1980. It is not classified as psychobiological disorder associated with changes in brain function and structural changes. PTSD accounts for 50 percent of outpatient mental health patients. Every year more and more people are being diagnosed with PTSD. PTSD is caused by a traumatic event. These events can include being a survivor of combat, a terrorist attack, natural disaster, or a serious accident. They can also include being a victim of assault or abuse and experiencing a sudden and major emotional loss. After experiencing a traumatic event, patients often have strong and unwanted memories of the event or flashbacks. Patients can encounter bad dreams and nightmares and emotional numbness. They may have intense guilt or worry, bursts of anger, and feeling on edge. PTSD sufferers also practice avoidance of thoughts and situations that could remind them of the event. There are several ways to treat PTSD and it varies based on the patient and their needs and responsiveness. Treatments can include cognitive behavioral therapy, medications or a combination of both. Cognitive behavioral therapy has different applications and techniques these include exposure therapy, cognitive restructuring, stress inoculation training, and virtual reality therapy. Exposure therapy is where the patient faces their trauma in a safe environment using mental imagery, writing, or visiting the site where the event happened. Cognitive reconstructing involves helping make sense of the events as they are not often recalled correctly, this helps patients view the event in a realistic way. Stress inoculation training is used to reduce stress and anxiety in a healthy manner. Virtual reality treatment is much like it sounds. A therapist will control an environment through the use of virtual reality technology and present the patient with the situation where the event occurred allowing for a safe processing of the event. There have also been studies on using white noise to treat symptoms of PTSD. White noise machines like the S-100 or the world class BST-100 can help alleviate sleep disorders and problems associated with PTSD. PTSD is a condition that can be deadly in extreme cases. If you or anyone you know suffers from PTSD consult your physician to start a treatment that will work for you.